"Help cross-out cervical cancer!" was the main message printed onto the back of each handmade greeting card. Making Greeting Cards was honoured to participate in the Great Eastern Women 10K Run on October 26th 2008 by making cards with the above message. We supplied the labours and the pharmaceceutical company provided the fund to purchase supplies for this project. 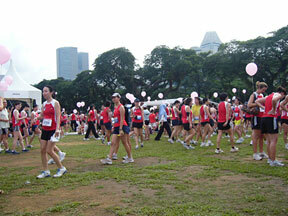 On 26th October 2008, 10 thousand women participated in the Great Eastern Women 10K, a women running event in Singapore. We were invited by GlaxoSmithKline, a pharmaceceutial company who was one of the co-sponsors for this event to make greeting cards, bookmarks and card kits to help support the Singapore Cancer Society. Altogether, 12 women, 2 men and 3 children participated in this Cards for a Good Cause project. One thousand cards, one hundred card kits and five hundred bookmarks were made within a two week period and were distributed out on that day. The one thousand cards consist of six card designs. One Singaporean woman is diagnosed with cervical cancer every 2 days1. Talk to your doctor. 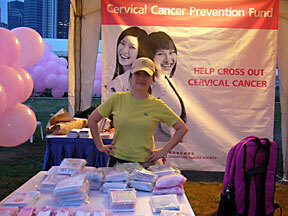 Help cross-out cervical cancer by Singapore Cancer Society's Cervical Cancer Prevention Fund. 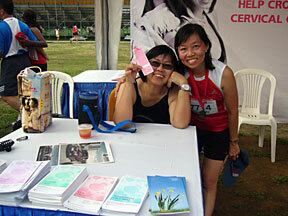 Persis Tan holding the last bookmark with a runner at the Singapore Cancer Society Booth. Notice that all the greeting cards, bookmarks and card kits disappeared from the two tables within 2 hours. The event started at 7.30 in the morning and ended at about 10.00am. Four of the main card makers were at the Padang to help out at the Singapore Cancer Society's booth. Some of us were there to set up the cards before 6.30am. All in all, it was a very satisfying experience and all of us were so relieved that everything went according to plan and we were able to complete all the greeting cards, bookmarks and card kits on time.. I guess after this event, we will be better equipped for any future Cards for a Good Cause projects. To read more about making greeting cards for a good cause and the helpful tips in organising a card making for charity event, just click on the link below.